Note: We have a new version DSO Nano v3 instead of DSO Nano v2, and this version Nano v2 won't be produced any more. 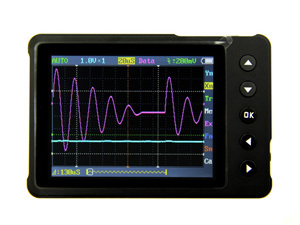 DSO Nano v2 is a Digital Storage Oscilloscope designed for basic electronic engineering tasks. Within its smart shell, the device runs on ARM Cortex™-M3 32 bit platform, provides basic waveform monitoring with extensive functions. It equips 320*240 color LCD, micro SD card storage, portable probes, LiPo Battery, USB connection and signal generator. Due to palm size and handy performance, it fits in-field diagnosis, quick measurement, hobbyist projects and wherever convenience matters. Scheme and source files are also open for re-innovating. Built-in Battery. The DSO is ready to work. -Mini USB cable is not included. You may need to buy one to charge up the DSO. -You many need a 2G Micro SD card to store the wave signal. DSO Nano v2 is a Digital Storage Oscilloscope designed for basic electronic engineering tasks. The device runs on the ARM Cortex™-M3 32 bit platform, providing basic waveform monitoring with extensive functions.